The relationships in our lives — whether with romantic partners, coworkers, family, or friends — are often our greatest source of both comfort and frustration. 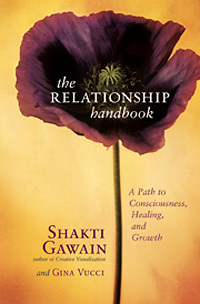 In The Relationship Handbook: A Path to Consciousness, Healing, and Growth, beloved bestselling author Shakti Gawain and her longtime coteacher Gina Vucci show how relationships also have the potential to be our greatest teachers. We hope you’ll enjoy this short excerpt from the book, which explores how we can use creative visualization to create positive change in our relationships. We hope you'll enjoy this short video in which Gina Vucci, coauthor with Shakti Gawain of The Relationship Handbook, talks about relationships as a path to consciousness, healing, and growth. We also invite you to subscribe to New World Library's YouTube Channel for immediate access to the latest author interviews, book trailers, and more. We hope you’ll enjoy this short excerpt from the book — Shakti’s first in nearly fifteen years. We hope you'll enjoy this short interview with New World Library cofounder Shakti Gawain, and we're thrilled to announce that this fall we will be publishing her much-anticipated new book, The Relationship Handbook: A Path to Consciousness, Healing, and Growth, which is currently available for preorder.